Guilin takes its name from the flowering acacia trees that scent the city in autumn. 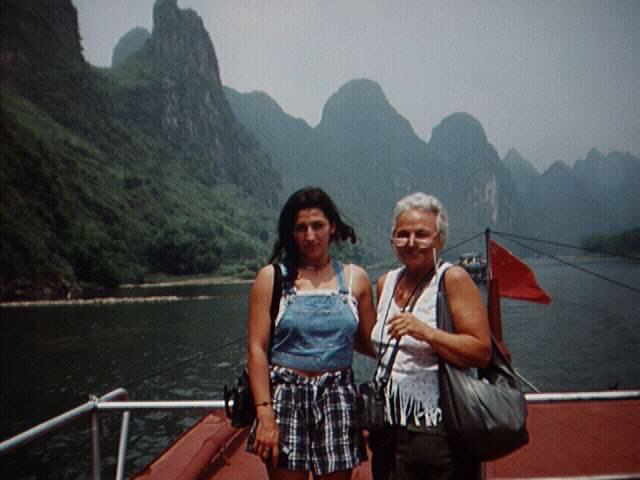 The Guilin region of Guangxi Yhuang, an autonomous region of south China, brought to my mind the mountains in Dr. Suess books, and looked just as unreal, as the limestone cliffs along the Li Jiang river. These awesome formations: the Li Jiang landscape, the karst regions of Yugoslavia, the Yucatan Peninsula, and the Alps, are made of limestone, a rock which is one of the most common on earth and covers nearly a quarter of the surface of china. Four hundred million years ago, southwestern China was a tropical sea, harboring a vast array of shelled sea life. In the warm ocean that covered the Guangxi region, marine organisms, laid down over millions of years, formed the limestone sediments. Limestone rock was pushed up by shifting tectonic plates in past aeons, and patiently sculpted by heavy rains. Hills and rivers of Guilin are only part of an immensely complex chemical cycle involving deposition and release of carbon dioxide from the vast limestone storehouse. The amount of carbon in sedimentary rocks is more than 600 times the total carbon content of the planets water, air, and living cells. Its slow accumulation and release is part of the drama of plate tectonics.